I’ve been a user of classic hair pomade for about 20 years, starting with Royal Crown, Murray’s, Black and White, and eventually trying a few more modern (water soluble) brands. But as my style changed, and my hair grew longer, my need for a better pomade became apparent. After months and months of searching my wife suggested just making my own product. I could create the hold, scent, and shine that I desired without having to spend time and money on other existing brands. In the Fall of 2007 we created Slicker Thn Hell. It had the feel, shine, hold, and scent that I wanted. What’s not at like about that?!? After a year of using and selling my own brand of pomade I finally decided to go out and better my original formula. Hence the new, and improved Slicker Thn Hell brand was born. Along with this new and improved version also came Devils Doo and Ginny Grease. Each brand carries its own weight, hold, and pleasing scent. Cause as we know, the Pleasing scent is half the point! 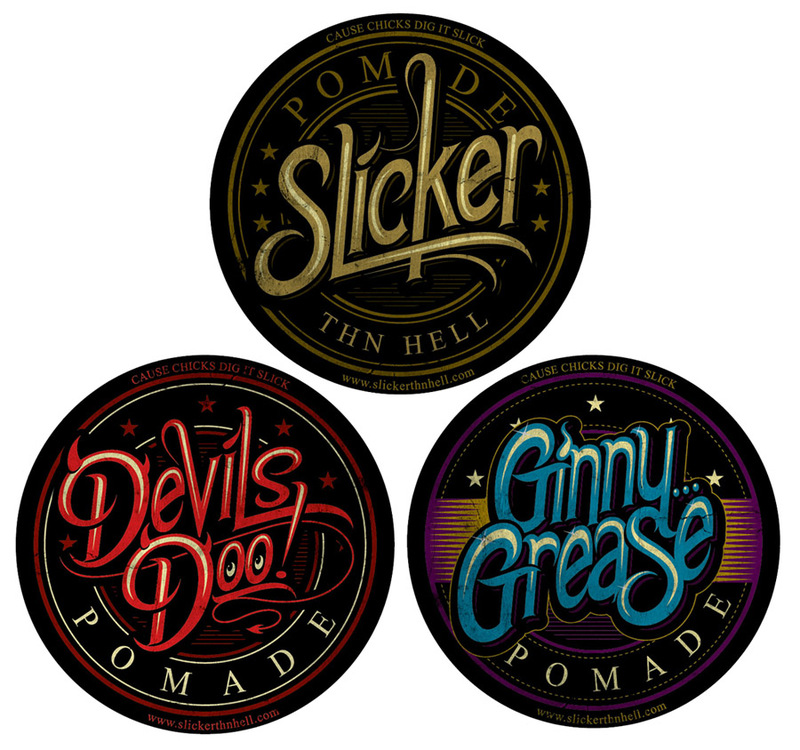 The 3 Slicker Thn Hell products are a straight up “Old Timey” hair pomade. So the hold and shine are solid and will not wash out like newer, more modern pomade. This also means that throughout the day, one may take a comb thru their hair and restyle without need of a sink or mirror. It’s literally taken me 2 years to find the perfect formula and over a year to have it produced. I’m very excited with these products and wear them proudly.